Virginia and Brandon tied the knot on Good Friday, and was it ever a Good Friday! It was such a casual day; perfect weather for exchanging vows overlooking the lake while family and friends gathered around as witnesses to their precious love. 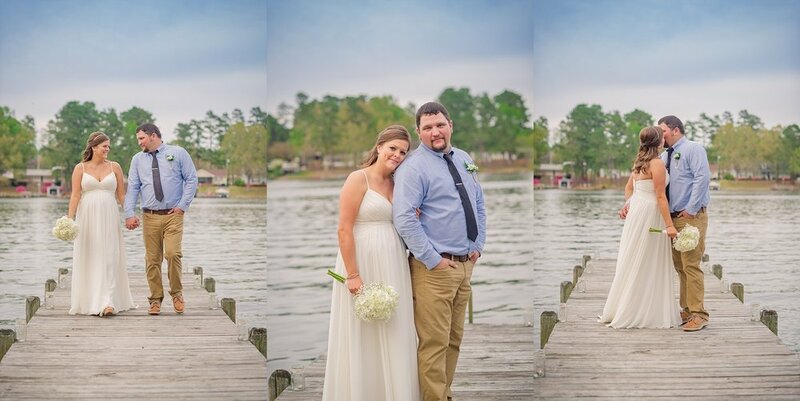 What I loved about their wedding was the fact that it was at the lake, where the two had met. To me, that simple detail created the perfect atmosphere for their wedding day. Overlooking Lake Marion, Virginia and Brandon exchanged vows and a few laughs before they sealed the deal with a kiss under the most beautiful arbor adorned with the prettiest florals I have seen! While they said their "I dos", Virginia's sisters stood as bridesmaids, and Brandon's brothers stood as his groomsmen. During their vows, I witnessed lots of sweet, happy tears for the couple. You can tell that they are so very loved by their friends and family. Though short and sweet, the wedding day was planned perfectly. Lots of gorgeous detail throughout and the sweetest red velvet cake to match, fun music played by a DJ and corn hole boards kept guests entertained during the evening festivities. We even had enough time to steal away for a few minutes to take a few sunset portraits. The sunset we had that evening was so amazing and undeniably a sweet sign for the newlyweds. I am so glad to have been a part of this wedding day. Check out a few of the moments from their wedding day below and leave them some blessings as they venture into marriage together.